I’m disillusioned with my union – the Michigan Education Association. When I needed help, the union wasn’t there. The Mackinac Center has somehow persuaded its new media darling, Mary Davenport, who works in the Lansing School District, to “speak out” against MEA. 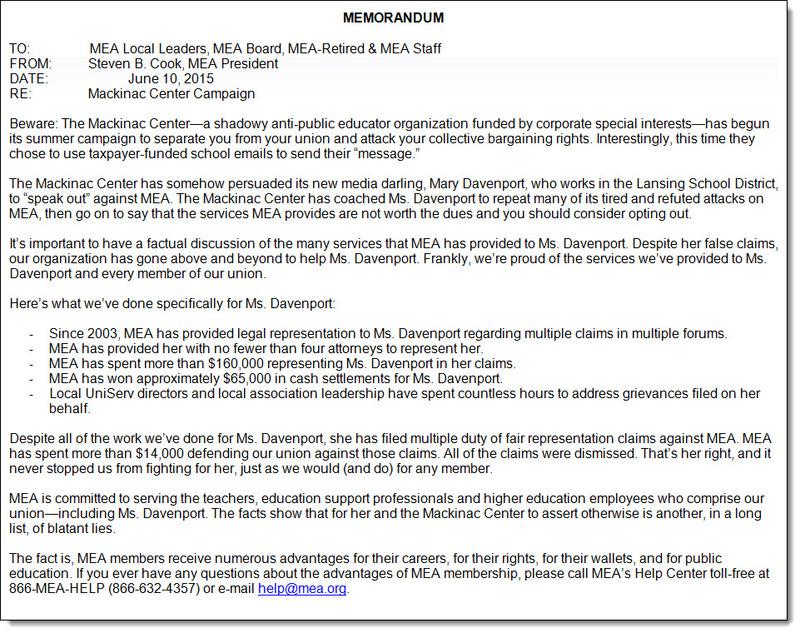 The Mackinac Center has coached Ms. Davenport to repeat many of its tired and refuted attacks on MEA, then go on to say that the services MEA provides are not worth the dues and you should consider opting out. It’s important to have a factual discussion of the many services that MEA has provided to Ms. Davenport. Despite her false claims, our organization has gone above and beyond to help Ms. Davenport. Frankly, we’re proud of the services we’ve provided to Ms. Davenport and every member of our union. – Since 2003, MEA has provided legal representation to Ms. Davenport regarding multiple claims in multiple forums. – MEA has provided her with no fewer than four attorneys to represent her. – MEA has spent more than $160,000 representing Ms. Davenport in her claims. – MEA has won approximately $65,000 in cash settlements for Ms. Davenport. – Local UniServ directors and local association leadership have spent countless hours to address grievances filed on her behalf. Despite all of the work we’ve done for Ms. Davenport, she has filed multiple duty of fair representation claims against MEA. MEA has spent more than $14,000 defending our union against those claims. All of the claims were dismissed. That’s her right, and it never stopped us from fighting for her, just as we would (and do) for any member. MEA is committed to serving the teachers, education support professionals and higher education employees who comprise our union—including Ms. Davenport. The facts show that for her and the Mackinac Center to assert otherwise is another, in a long list, of blatant lies.